The approximate location of Whitestone Hill. 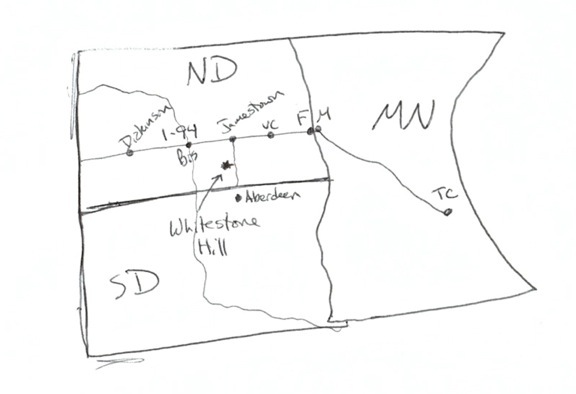 I’ve decided that very few people know the location of Whitestone Hill in southeastern North Dakota. This decision came to me after hearing the “Where is that?” response to my remark, “Whitestone Hill…” It is now 2013. This location, Whitestone Hill, is important since it is a site where the U.S. Army brought total war to a domestic encampment of northern Great Plains indigenes in early September of 1863. We are almost upon the 150th year of remembrance. So we need to make ourselves more aware of these sites, primarily because our history — whether we know or like it or not — informs us about how things are today. It is also the stuff that disparate groups identify with. This is why we sometimes hear things like, “History is about identity.” This is true. 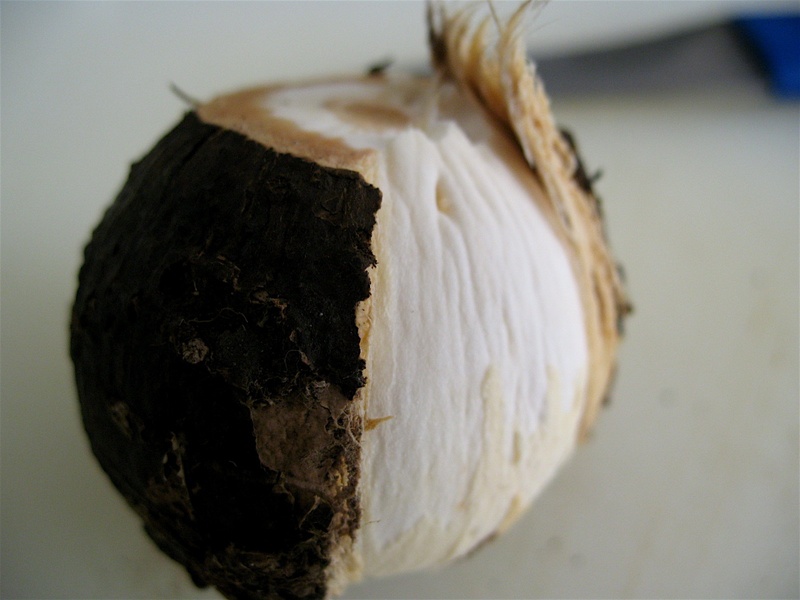 If we don’t know about Whitestone Hill, then we don’t know why things are the way they are today. So people can more readily find Whitestone Hill, over the lunch hour I decided to scribble out a map, and also scan a DeLorme topo map of the location specifics. I’m blogging about it now, and I figure that if folks ask me, “Where is that?” instead of me gesturing in the air about the relative location of Whitestone Hill to Jamestown, Aberdeen, Edgeley or Ellendale, I can just send them this link. Above is a rough sketch of the approximate location of Whitestone Hill that I prepared while eating squash and cauliflower curry soup over the lunch hour. A DeLorme map of the Whitestone Hill location. If you’re on Eisenhower’s Interstate 94, just head south from Jamestown, North Dakota on Highway 281. If you’re in Aberdeen, South Dakota, head north on Highway 281. If coming from Jamestown, drive about 40 or 50 minutes south until you hit Edgeley, North Dakota. From Edgeley, head west on ND Highway 13, and this eventually turns into south-bound Highway 56. Travel south of Kulm about 10 or 11 miles to 88th Street SE. Travel east on 88th Street SE for four miles, and then turn north (by this point you’ll see “Whitestone Hill” signage to direct you to the site). If coming from Aberdeen, South Dakota, drive north to Ellendale, North Dakota, and head west on ND Highway 11. Travel west on Hwy 11 for about 20 miles, and turn north onto ND Highway 56. Drive 10 miles north on Highway 56, and turn east on to 88th Street SE. Drive the four miles east, and turn north at the Whitestone Hill signage. Note: even though the signage on the DeLorme map reads “Battlefield,” and even though during your approach you will start seeing “Whitestone Hill Battlefield” signage, do not be tempted to call it that unless you are ready to define what is meant by that. Even then, it is not a good idea. 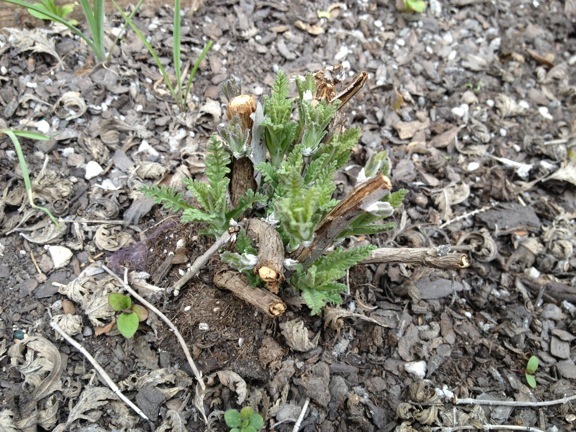 When it was mid-Spring, just before the weather stopped dropping below 32 F at night, the sturdy Russian sage pushed up out of the soil. This is what it looked like at some point in April-May. Russian sage in the spring on the North American steppe. Earlier this morning I scrolled past this image while looking for some photos of the ongoing public humanities discussions we’ve been having concerning the Dakota Wars circa 1862-64. Then I looked at what the Russian sage looked like yesterday evening (August 2013). The honey bees stay busy with all the blooms. Sometimes we gotta stop and smell the Russian sage — it appears the Europeans are better at it than the Americans. That is also what I thought. 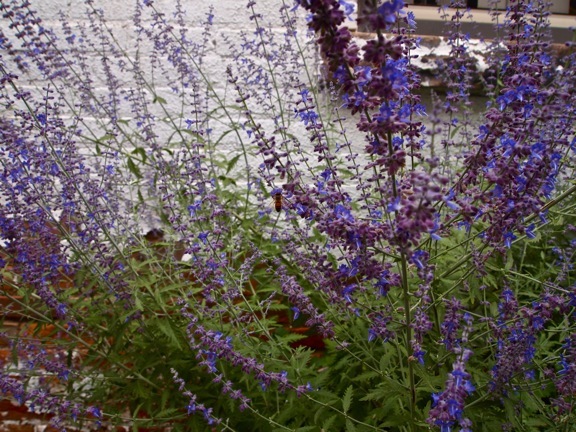 Russian sage in August 2013. This morning, while reading about Caraher’s physical concerns as a field archaeologist, I took the third slug of coffee from the first home roasted coffee batch. 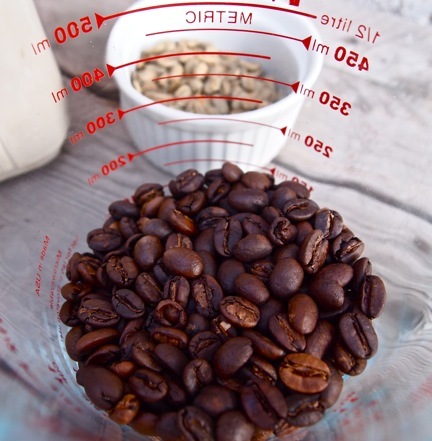 To home roast the coffee, I used a corn/maize air popper, and learned how to do this just over a week ago when Molly and I visited Dawn and Theresa Paul who reside in Edgeley, south-central North Dakota. It works great, and there appears to be a huge body of DIY internet information on this (which, like numerous things, I only now am discovering). Here is what the roasting looked like this morning. Roasted coffee from this morning. Green coffee beans just above that. Anyhow, I thought I’d give you some quick backdrop on Dawn and Theresa and then share another project they finished in Edgeley. Dawn and Theresa used to live on St. Croix. When they first said this, I responded with, “You’re talking about the Virgin Islands and not Minnesota, correct?” (When someone says they are from Oslo, I always do the same thing and ask, “Norway and not Minnesota, right?”) Yes, they were talking about the Caribbean. They both lived on the island for quite a time, developing a house and setting themselves into a variety of projects. Eventually, though, they wanted to relocate to the northern Great Plains (I think this in part had to do with Theresa’s family connections to the area). They claim to be “retired,” but after visiting with Dawn for over an hour I balked at this assertion, or at least modified it. I said, “You’re retired, but busy as ever.” He agreed. 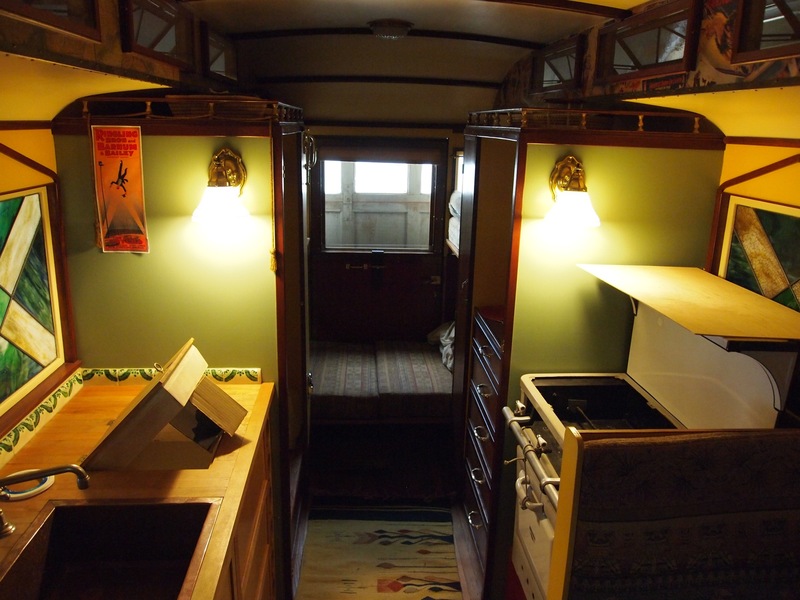 Below are photos of a rehabilitated and restored circus conversion van. Dawn and Theresa can give you the details way better than I can, but the short and skinny of it is this: they discovered this vehicle years back, the vehicle having been abandoned or nearly abandoned. 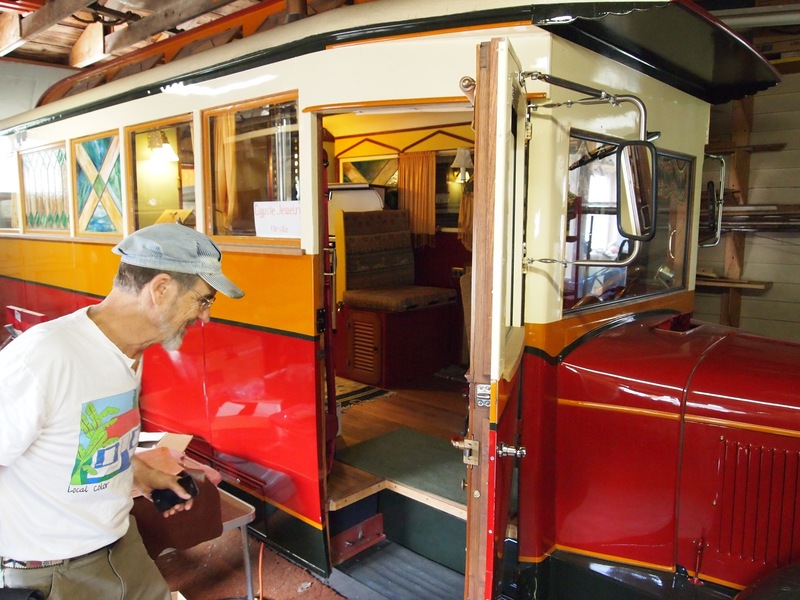 It is a motor home that early 20th-century circus people would use while traveling the circus circuit. 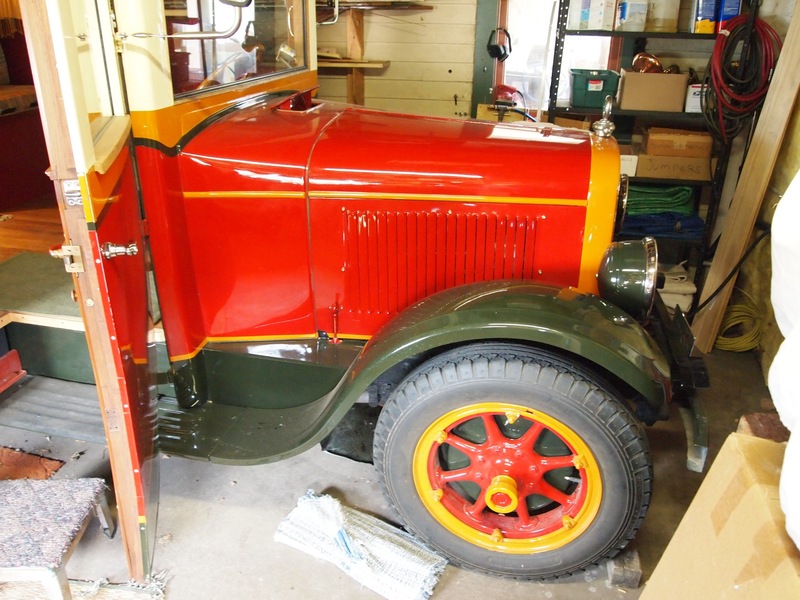 This particular van was owned by “The Great Arturo” of the Ringling Brothers and Barnum & Bailey circus shows. The Great Arturo, I learned, was center ring. The cockpit of the sweet circus ride. Dawn entering the sweet ride. The front 1/3 of the sweet circus ride. 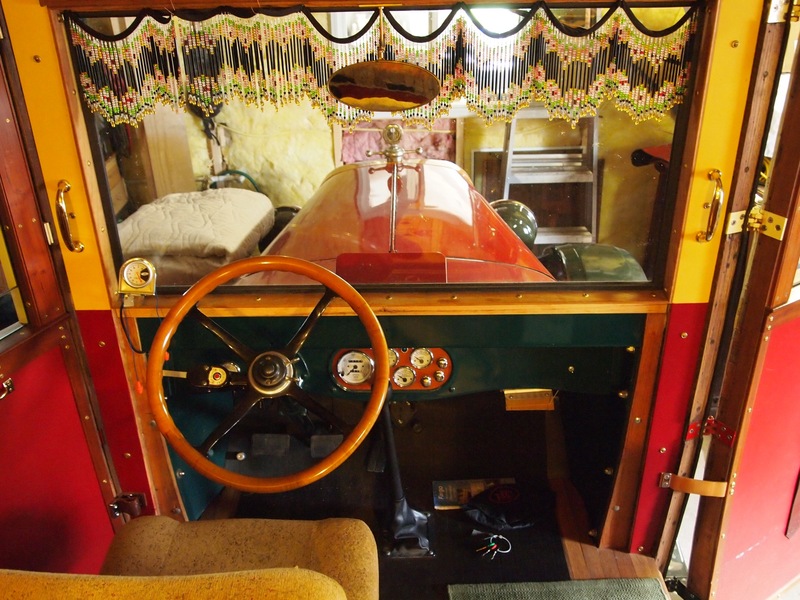 An interior shot of the sweet circus ride. Note the stove range to the right; dresser just behind that; sink to the lower left; toilet further back; and bed at the way back. This Saturday, Jessica Christy (an artist who also happens to be one of my cousins) will be showing her work at DK Gallery in downtown Fargo, North Dakota. This is a copy of the official handbill she is circulating. 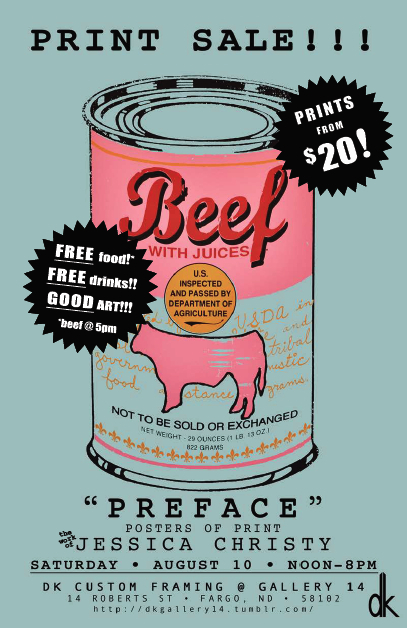 I figured since she is doing these spectacular Warhol-Factory-esque prints of the USDA’s finest canned beef w/ juices, then it would be okay for me to copy the handbill and post it on my blog. …consists of coarse ground beef cooked in its own juices for use in a variety of applications, including barbecue beef, pizza, soups, stews, spaghetti sauce, vegetable stir-fry, casseroles, and similar items. 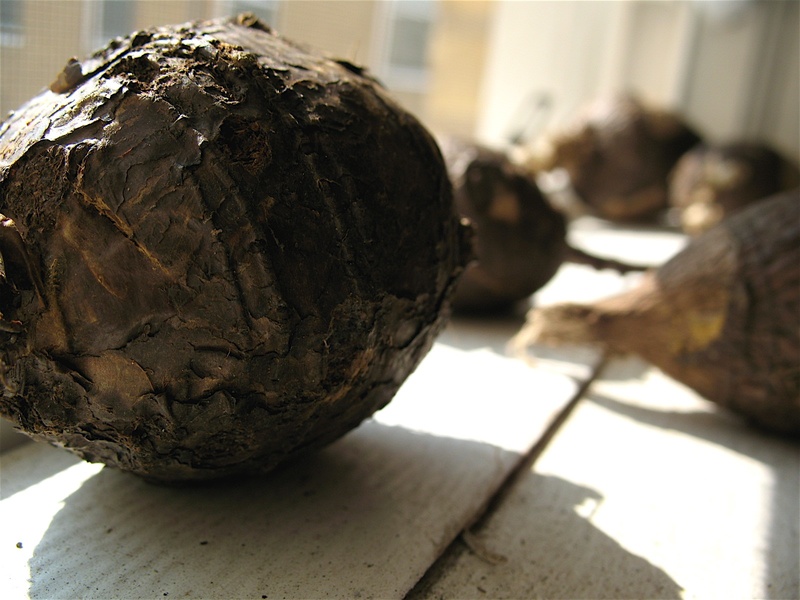 One might make the argument that we, as an increasingly hybridized digital corporate-nation, are becoming a bit disconnected from where our stuff comes from, food included. This in turn is problematic because a government is, as laid down by our founders, a nation by the people, for the people, whereas a corporation is beholden to do one thing and one thing only: make money for the shareholders. I of course would not make this argument, and I would advise against bringing up the idea in polite company. But if someone else wanted to, they certainly could. Never mind all of that, though. We need to move product here, folks, so let’s get to it. See you Saturday! Don’t forget to bring your Andrew Jacksons!